time again to write some words on the new EC Time features. But first let me step back a bit and take a look at our time management solution in total. Cause myself and development teams are always busy with the current development release, thinking and working in 3 months release cycles. When the actual release is shipped to customers we are already working on the successor release. We are so deep in the release by release wheel that we often tend to forget what we have achieved so far in general. So, let me take this last opportunity in 2017 to step back a bit and look on our product rather from a birds perspective. Time off started in 2012. In the beginning I don´t think many would have expected that it becomes such a flexible, comprehensive time account accrual machinery with all kinds of variation of daily, weekly, monthly, yearly accruals based on whatever parameters as it is nowadays. With a user interface that still is outstanding compared with others in its usability and attractiveness. With an intense and pre-build EC Payroll integration that covers many localization topics. With lots of business rule functions that cater for nearly all constellations. Then time sheet and time valuation – that was started in late 2014. Only 3 years ago! Having a look on what is in the time valuation engine overall I am really proud of being part of this team. Valuation running real time, lots of flexible time valuation operations, overtime calculation, break deduction, pay type generation possibilities, working time accounts, time collectors, input validation rules and and and – all coming with a really cool user interface. Looking on the last 4 releases of 2017 there are great enhancements as well. To name only a few: time sheet input validations, mobile time sheet, time account snapshot and balance replication to SAP Payroll, Time Account process simulator, time admin workbench enhancements, mass approval, time collectors, error messages in time sheet upon evaluated times, lots of localization features for time off, nearly a ton of new business rule functions and even new time valuation types.These are only the big ones, there are also lots of useful minor features. Check my past blogs to get an overview on what we have delivered this year. Hence, we again brought our EC Time solution many steps forward this year and I am already looking forward to 2018 where we will continue and step into a complete new topic to round up our solution portfolio by targeting the long missing clock in / out integration. Lets have a look on customer numbers. Where does EC Time stand at the moment in terms of customer numbers? Tremendous increase compared this year with the previous. We get next to 600 EC Time customers, thereoff more than 120 using Time Sheet and Time Valuation. Looking only on time sheet – this is an increase of 1000% within one year! Really impressive. Okay, last year we had only 10 customers and this makes the percentual increase so huge ;-). But for me it could be always like this. And it shows that customers are using what we provide and that we are heading into the right direction. That we can help customers running their business. And it shows the trend. Listening to consultants, partners and customers I can predict that this rise is going to continue next year. When I meet with customers or got deep dive customer phone calls that are still an SAP ERP Time customer I often get the question when we will be at that level. When we will cover same than RPTIME programm with it lots of schemas and personell rules. And I always tend to say: you don´t want us to be there again. Yes, schemas and personell rules are flexible. But at the same time languaros. No innovation possible. No fast delivery possible. No implementation at low cost possible. Not an easy task to maintan for customers. Hence, no, we don´t want to be at SAP ERP Time level. Cloud is different. You need to think simpler. You have choosen a cloud solution amongst others to operate it at reduced costs than an onprem solution. You have choosen a cloud solution to manage it simpler, streamline processes, benefit from fast innovations and enhancements. This is different than onprem solution. We cannot provide all the configuration options SAP ERP Time Valuation provides. Where it takes years to implement it for customers. Where tiny specialities could be configured even only for a handfull of employees- but at a massive implementation and maintenance cost. When there would be a check of the implemented SAP ERP Time valuation schemas at customers side – how much in it is actually still needed? How many personell rules are outdated but no one knows? And how many experts are still out there who understand each and any rule in customers schemas ad hoc? SAP ERP Time valuation is a massive and strong configuration beast – with lots of hunger in terms of maintenance cost. We don´t want to be a copy of this. Rather we want deliver best practice business solutions for many of the business processes supported by SAP ERP Time – but not in the same configuration depth. In some areas we provide already more flexibility and easiness of configuration. Take our business rules or time valuation rules for example that can be understood by everyone. It is not a quasi-coding language that has to be studied like the personell rules and schemas of SAP ERP Time known only by a few (and less getting) experts. 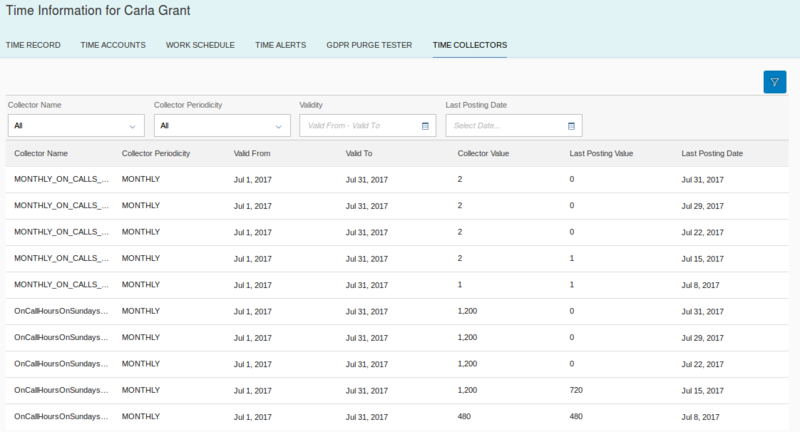 Everyone can now configure EC time valuation. And, most important, the time calculation engine runs real time. Employee records time data and it gets evaluated immediately. Not overnight like in SAP onprem Time. Always at any time accurate data available. Customers can benefit from a more streamlined, cost saving solution that offers best practices. And this is what we do and plan to do further. Not rebuilding the old. Now coming to the facts. What is in the box of the Q4 2017 release? First we did a lots for data privacy and data protection. EU based consultants / customers know that next year the new GDPR (General Data Protection Regulation) comes true. This deals a lot with erasing of personell data when it is not needed for the business anymore, read access log on sensitive data, information reports on what data is stored for an employee and so on. To support customers on this issue we did a lot of developments in Successfactors and of course in EC Time. Lets go a bit more into details. This is a step towards a more solid and “round” time sheet life cylce. As we started with time sheet and time valuation in 2014 we designed the time sheet for the limited use case of positive time recording. Hourly employees that get paid for the hours they worked and recorded in the time sheet. When a time sheet is approved and the employee adapts it afterwards (a so called amendment) but this amended time sheet was declined by the approver, we reverted the time sheet back to the last approved one. This was necessary to ensure that an employee gets paid in the next payroll run. However, this led to the result that all amendments where removed – the employee had to re-enter them. This was done because not that many amendments happen for positive time hourly recorders. Then we enhanced the time sheet for negative time (see my excursus on the difference methods below). Due to the inner logic of time sheet generate jobs each time recording of a negative time recorder is a kind of amendment. When a negative time recorder has however lots of time data recorded and the time sheet was rejected, the time sheet reverted back to the generated times based on the workschedule -which was quite cumbersome for the employee cause he had to re-do all his time recordings – even when he has recorded only allowances or on call times for example. This has now changed. A new status approval status has been introduced into the time sheet life cycle, called, “declined”, and a time sheet with this status still contains all previously recorded data. Nothing is reverted back automatically. 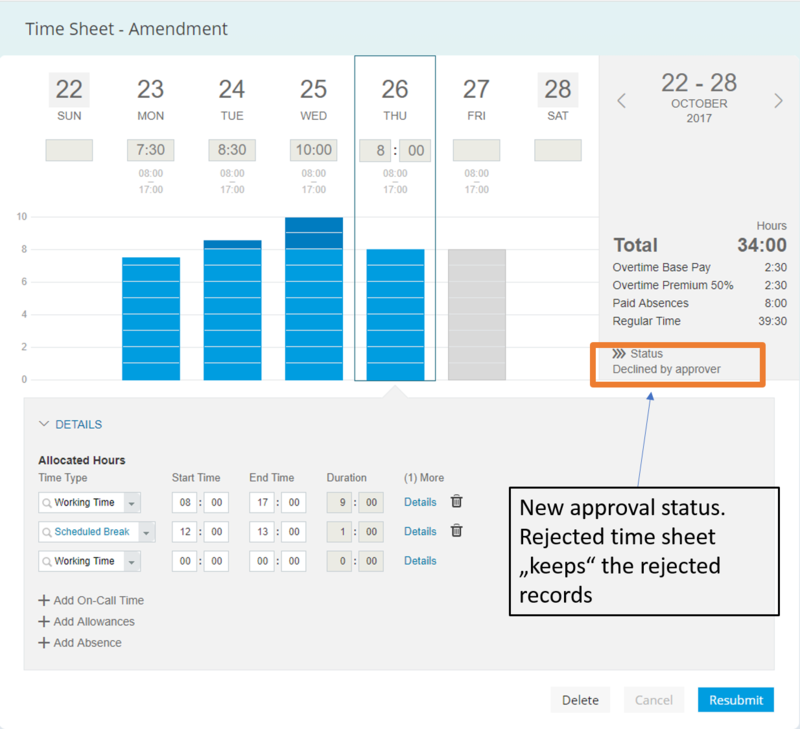 Employees can adapt the records that where the cause of approval decline and submit the time sheet again without having to re-enter all the other time records entered as an amendment (or for negative time recorders: deviations from the workschedule). Based on the new status the system can send notifications to employees informing them that the time sheet has been rejected. Excursus: Negative and positive time recording, Absence only and overtime only – what is this all about? Quite easy: this is when employees record only absences like vacation, illness, jury duty. They enter records when they are not performing work or are not busy for the employer. You use this when you want to track absence entitlements (like vacation), document absences like sickness, need to send this absence records to a payroll system (unpaid absences for example to cut the salary) or simply want to provide a team absence calendar for your employees. This employees usually are salaried paid employees. This is covered with our Time Off solution in Employee Central. Employees need to record ALL their time data. Attendance time and absence times. The attendance time recording part can be done due to multiple reasons: the most simple one is for hourly paid employees. When they don´t record attendance times they are not paid – cause no system can calculate the hours for base pay. But even many salaried employees need to record their working time. Be it for compliance reasons, for documenation purpose, overtime calculation purpose or cause they have got a working time account where all recorded times per day are compared with the planned time and the delta is posted daily to a time account. Negative time recorder can be salaried (most often) or hourly paid. They don´t need to record their working time. They have got a workschedule assigned and as long as they don´t record any deviations from the workschedule, the system assumes the employee has worked according to his plan. This can mean that the time valuation calculates premiums for shift work (early / late shift premium) or for Sunday work without having the employee to record any working time. Each day the planned time of the employee is converted automatically to recorded time and time valuation gets triggered. If the employee has a shift on Sunday, time valuation calculates automatically Sunday premium. The only thing the employee needs to record are deviations from the work schedule. Deviations are: absences (vacation, sickness…) or when the employee has worked longer (overtime), on a different day, or at a different time for example. So, each deviations from the workschedule need to be recorded. They get intermingled with the work schedule times. This method applies for all employees that only need to record those times that are in excess of their working time (plus absences when needed). These need to be salaried employees (or nobody would work for this employer ;-)). Planned times of the work schedule do not play any role here (even not to find out if the recorded time was overtime or not). Our time sheet solution in Employee Central covers positive time, negative time and overtime only (and of course you can record absences in the time sheet as well). Hope this helps a bit to gain a common understanding on the different time recording methods. Time admins can now easily track the progress and the balance of specific collectors per employee. They can detect for example when an employee has worked too much late shifts in a month, has performed more than 4 on call times in the last 2 months, has worked more than 200 hours per month and so on. Time Management can be complex and variable. Lots of workschedules, different time profiles, time valuation rules, time accounts and so on. We try constantly to make implementation and maintenance of the configuration easier. We have provided in the past releases the time valuation trace that gives you details on the applied time valution rules and results, we have provided the time account accrual simulator that simulates the time account accrual giving you the chance to review and adapt the accrual rule when the result is not what you want to get and there is also the time configuration check tool that checks all configuration for an employee and gives you error messages / warnings when there are inconsistencies or errors in the configuration. 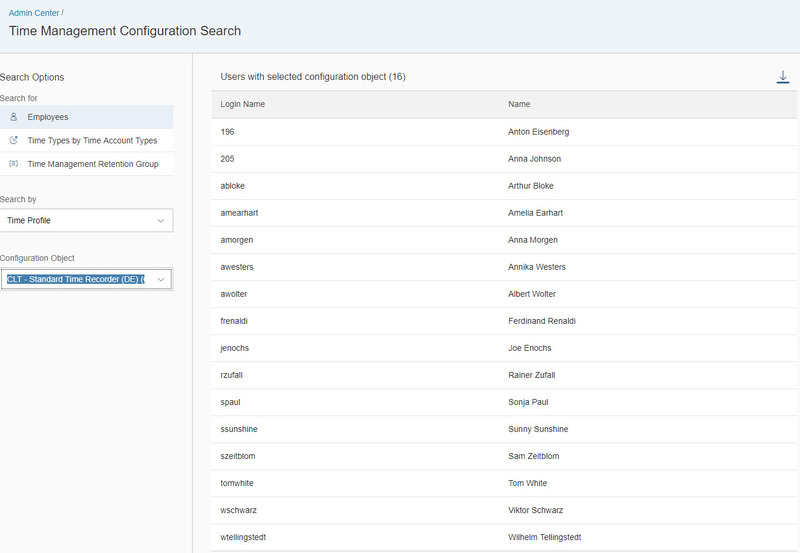 And now we provide another piece that facilitates system maintenance: the time configuration search tool. 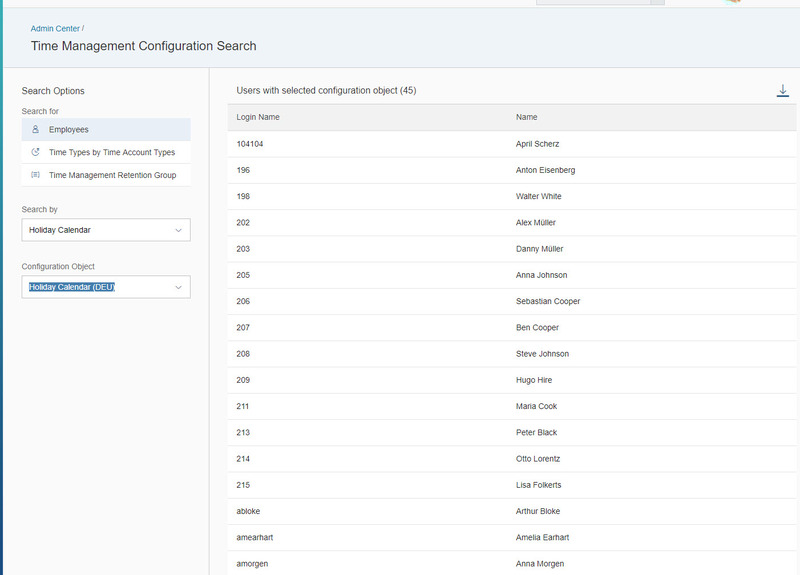 This tool allows to search for configuration objects that are directly or indirectly assigned to employees. You can get a list of employees that have got a specific time account, work schedule, holiday calendar, time type, time type profile, time recording profile for example. This tool is quite useful and we will enhance it further in future and incorporate for example even time valuation rules and time type groups. This new feature is a rather small one, albeit important one. Working time accounts are a kind of enhancement of the time off in lieu accounts and we shipped them some releases ago. Upon each time recording the daily sum of attendance and absences hours (depending on your configuration) are taken and compared with the planned working time of the day. If less hours are recorded the delta is posted as a minus booking to the working time account, if more hours are recorded the delta is posted as a positive value. This is a kind of “flexible working time” where overtime is not paid for each day that an employee works longer, but rather balanced out in the future course. The employee can accumulate additional day offs by working longer on some days (of course specific rules can be applied that an employee does not record more than 10hours per day or more than 50 per week for example) or he can leave earlier on friday when he has worked longer on other days. Up to this release the working time account difference was posted regardless if the time sheet was approved or unapproved. Immediately upon time recording the working time account was filled. This allows for example an employee to work on Monday two hours longer and leave on Friday two hours earlier even when he submits his time sheet only on Friday and approval did not take place. 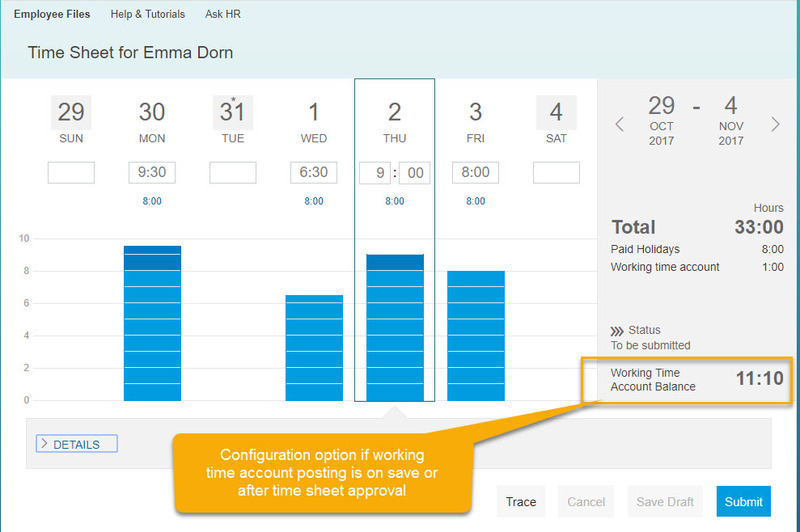 Based on customer feedback we provided now the same configuration option as for time off in lieu accounts: you can configure if you want to have an instant working time account posting – or only a posting after the time sheet approval. Although we got a real-time time valuation running there are nevertheless some jobs necessary that run in the background. There is for example a job that generates for negative time recorders daily the planned working time as actual hours worked. Or that submits time sheets for negative time recorders automatically at the end of the week (cause you don´t want to have the negative time recorders need to submit their time sheets although they have none deviations recorded, but worked exactly according to the workschedule.) Or when working time accounts are configured and employee has not recorded any times for yesterday time valuation needs to run nevertheless, detect this and post a working time difference. And there are a couple of other reasons why some time sheet jobs need to run in the background. Now there might be in rare constellations the situation that the time sheet generate jobs can´t be finished and no time sheets are generated. We have now put mechanisms into place that detect this constellations and re-runs the job automatically. Hence this caters for data quality and less manual steps for customers to review the job logs and re-run the jobs manually. In addition you can now start the time valuation manually for one or many employees and trigger an instant recalculation. This might be the case when you change time evaluation configuration for the past and you want to re-evaluate specific employees. 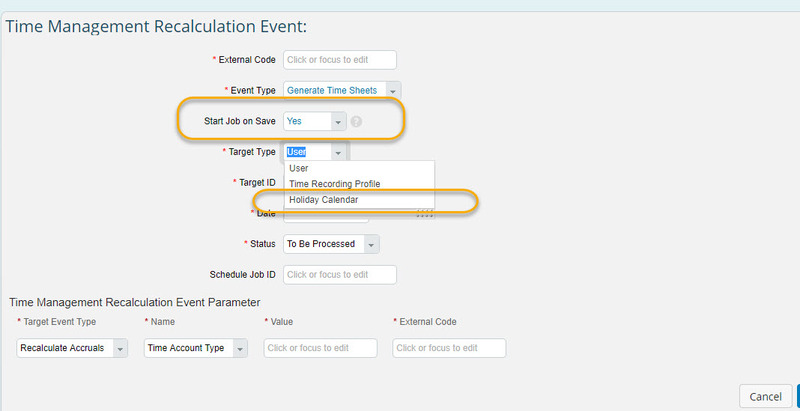 You need to create a recalculation event via manage data and set the flag “start on save”. You can either choose an employee or a time recording profile (and then all employees with this time recording profile are recalculated). In the screenshot above you see a second new feature: trigger of a recalculation event for a specific public holiday calendar. This was done for customers in China (and some other countries). In these countries there are ad hoc announced public holidays. This public holidays are announced in the course of the year and for the actual year. Changes in public holiday calendars when they have already been assigned to employees in the job information did so far not trigger a recalculation event. Hence absences that that was recorded on such a day have not been re-evaluated. To overcome this you had to assign a new public holiday calendar with the newly announced public holidays in it to the employees. This triggerd a recalculation cause it was a new assignment in the job information. But to change the job information was regarded as a cumbersome process by customers. Hence we enhanced our solution: you can now adapt an already assigned public holiday, create a recalculation event and absences, time accounts and time sheets are recalculated and you don´t need to assign a new public holiday calendar anymore. Some customers don´t want to show in the termination portlet the time account balance as of termination date. You can now configure with this new permission if the balance is shown or not in the termination process. So, that´s it. This were the Q4 features in EC Time. Then a glimpse on next year: What´s up to come? I am happy to announce that we finally started to get into the topic of clock in / out terminal integration. For the ERP folks: this will be a cloud equivalent for the HR PDC interface (or for those of the early days: CC1 interface). We gonna work on this in the course of next year and I´ll keep you posted in my blogs on the progression of it. Goal is to provide a proper punch in / out or clock in / out interface, we do the pair formation and all the rest of business standard processes that needs to be build around this topic. Best wishes for all your EC Time implementations. Feedback is welcome.